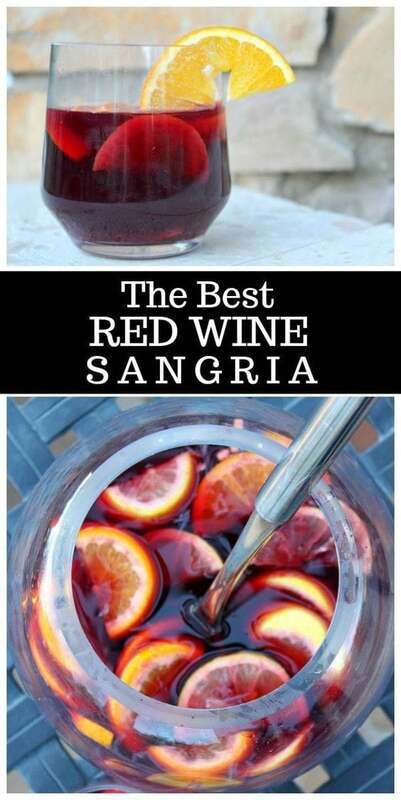 You are going to love The Best Red Wine Sangria Recipe. Watch the video showing you how to make this recipe, then scroll to the bottom of this post and print out the recipe so you can make it at home. 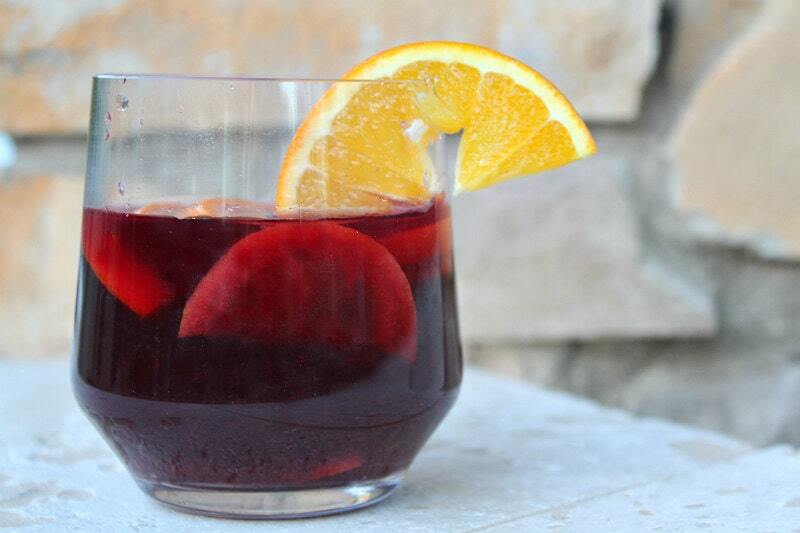 What makes this The Best Red Wine Sangria? This recipe is thought of as “the best” because it best emulates what you might sample if you were to visit Spain or Portugal. I’m not sure how authentic it is, but everyone seems to love it. I’m delighted that this does not turn out to be the god-awful sweet version of red wine sangria that I’ve had so many times. There is sugar in the recipe– but not an overwhelming amount. Munch on the wine-soaked orange slices after the sangria is gone. Whooo – eeeee! yum. This recipe is a definite keeper. I love to make this recipe to share between just my husband and me. It only calls for one bottle of red wine, and we don’t have any problem drinking a bottle of wine between us! Double or triple the recipe to serve at a party. What’s a good wine to buy for The Best Red Wine Sangria? 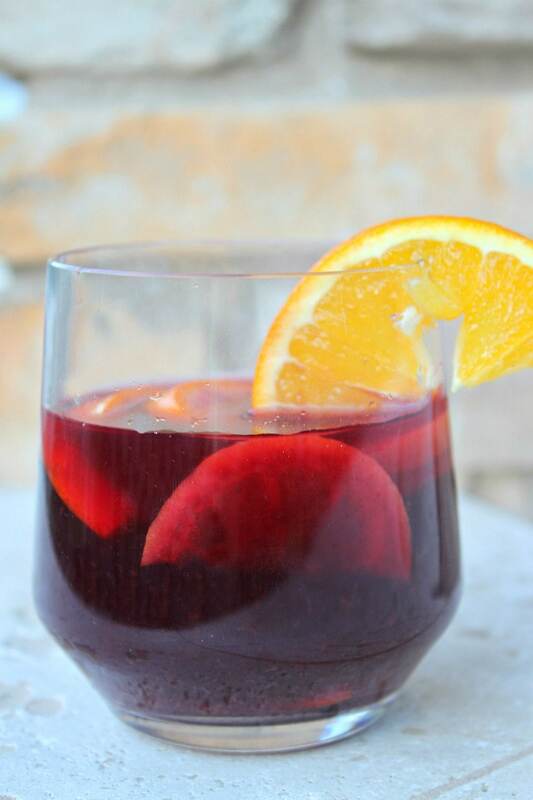 You don’t need to buy an expensive red wine to make The Best Red Wine Sangria! I like to use an inexpensive Rioja (Spanish wine). Combined with the other flavors in the sangria, it works perfectly! The recipe includes a good amount of citrus- both lemon and orange. A little bit of triple sec and brandy is added in too. Can you make The Best Red Wine Sangria ahead of time? Yes, you can definitely prepare this sangria ahead of time. After you prepare it, put the pitcher of sangria into the fridge for several hours to meld the flavors and chill it well. Make it in the morning if you plan to enjoy it for Happy Hour or in the evening. This might just become your new favorite sangria recipe! Can you keep leftovers of this sangria and drink it later? Sort of. I think it’s best if you have let it “marinate” for several hours and then drink it all up after that. But putting it in the fridge again for another day of waiting might be a bit too much. It won’t be as fresh and tasty as if you’d made it the same day. 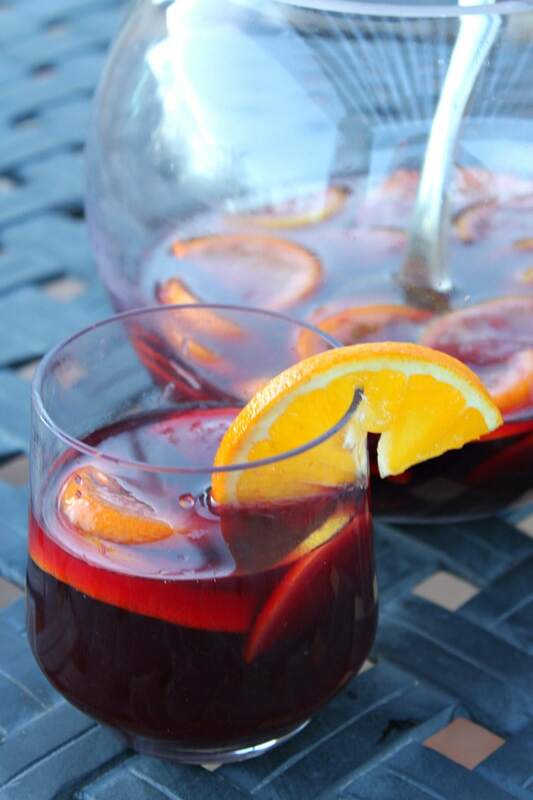 I’m a big lover of sangria, so I suggest you check out all of my sangria recipes! If you’re looking for more party punch type recipes, I can recommend my Vodka Party Punch or this Pomegranate Punch (with added vodka). This Amaretto Bourbon Punch looks good too! 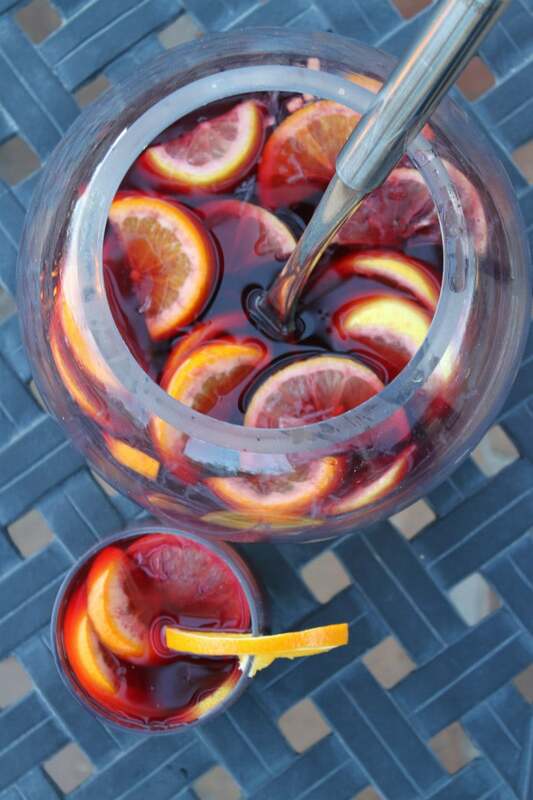 This is the best sangria recipe using red wine, citrus, brandy and Triple Sec! Slice one orange, and squeeze the juice out of the 2nd orange. Slice the lemon. Add sliced orange and lemon and sugar to a large pitcher; mash gently with wooden spoon until the fruit releases some juice, but is not totally crushed, and sugar dissolves, about 1 minute. Stir in the orange juice, Triple Sec, and wine; refrigerate for at least 2, and up to 8 hours. Before serving, stir again and add a drizzle of brandy (if using). Serve immediately over ice cubes in individual glasses. Or, if it's well-chilled, you may choose not to use ice at all. Cook's Illustrated tested this recipe with more expensive red wines too and they found that the cheaper wine tasted just fine. It really is okay to buy an inexpensive bottle for this recipe. I use a Spanish wine... anything like a Rioja or the like is okay. 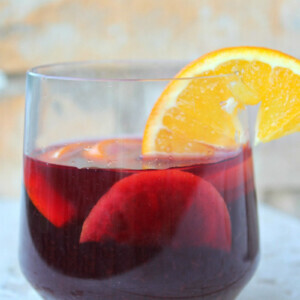 The longer sangria sits before drinking, the more smooth and mellow it will taste. A full day is best, but if that isn't possible, give it an absolute minimum of two hours to sit. You can easily double or triple the recipe- just switch to a punch bowl instead of a pitcher.